I must have had a sheltered life because it is only in the last few months I have even heard of osso buco. 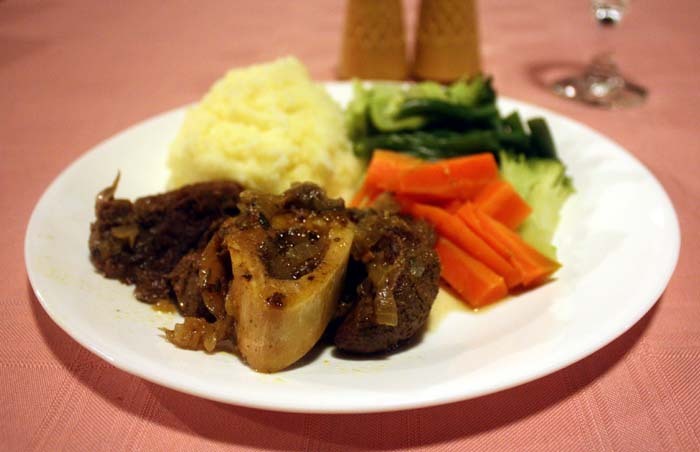 Right now beef osso buco is absolutely my favourite meat! I simply brown it in a pan with some onions then add water, and a little thyme and rosemary from the garden, and boil it until tender. And this time it was fantastic, fall off the bone, melt in your mouth tender. With mashed potatoes and a few vegetables on the side, I don’t think food comes much better than this. And of course, the highlight of the meal is sucking the marrow out of the bone. This entry was posted in Meat dishes. Bookmark the permalink.